Please check out a copy of Pure Green Living, Volume 3, a beautiful “independent print for a stylish green lifestyle” edited by Celine McKay. 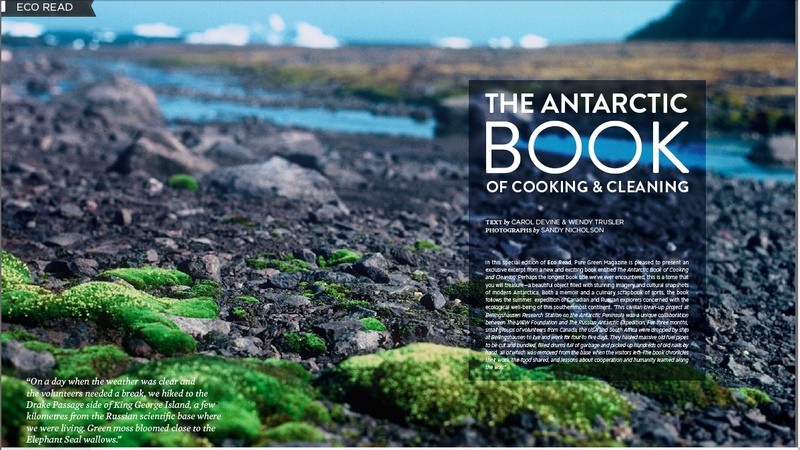 The Antarctic Book of Cooking and Cleaning is featured in their Eco Read section, with a sneak peak recipe for summer by Wendy (and all year round recipe as she made it for volunteers in Antarctica on our civilian clean up project at Bellingshausen station.) Hint: includes cold chocolate and creme. Here’s the Canada stocklist for where you can get it across Canada, in the US, England & Japan.